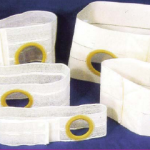 Choose Regular Elastic or Cool Comfort.Standard Features…… Our belts, made of a blend of polyester and elastic, are Latex free and come in a variety of widths and feature an opening reinforced with a durable plastic ring for 360 ° wafer and pouch support. Each belt secures with a sturdy Velcro® type closure that’s adjustable to get the perfect fit. Whether you have a hernia or want to avoid one, Nu-Hope has the right belt for you! DETAILS The completely opaque white front conceals both the urine & stoma. The backside is clear; helpful when applying the pouch and checking for proper fit of the stoma. Two center seams aid in better maintaining pouch shape and flatness. Convenient and ready-to-use. We have or can get the complete line of NU-HOPE pouches. Please contact us for more information.